Professor Neil Turok, an Imperial alum, described the quantum beginnings of the universe in the annual Peter Lindsay memorial lecture. Professor Turok gained his PhD from Imperial and has been a Reader at the College. He is currently the Director and Niels Bohr Chair at the Perimeter Institute for Theoretical Physics in Ontario, Canada. He gave a lecture on how ideas of the origin of the universe have changed over time, concluding with his current work on a ‘quantum’ beginning of the universe. In this theory the origin of the ‘astonishingly simple’ cosmos we see today, which can be described with just a few fundamental numbers, can be explained without the need for strange new ingredients. Professor Turok argued this model of the universe’s beginnings has more testable predictions – meaning it is easier to prove (or disprove) than many current theories. He also described how his theories conflicted with Stephen Hawking’s, leading to a bet between the two, which he said he is currently on the way to winning. The full lecture can be watched in the video at the top. 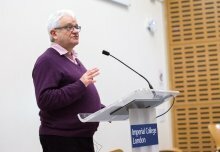 The annual lecture, presented by the Department of Electrical and Electronic Engineering, honours Professor Peter Lindsay, who completed his bachelors, masters and doctorate at Imperial after fleeing Poland in 1939.